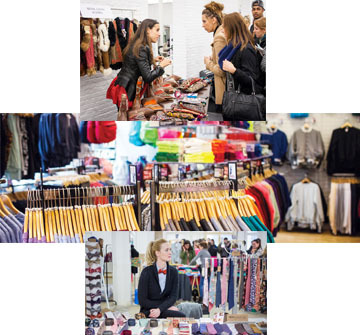 Apparel Report: The European apparel market is highly sophisticated, fast and very segmented. This means that randomly approaching the market as a garment manufacturer from a developing country will most likely lead to failure. Instead, you have to match your offer very specifically to a specific segment, or even a niche. Below are Ten Tips about this and other vital aspects of finding buyers on the European apparel market. 1. Find out which segment offers you the best opportunities. Before you try to do business on the European market, you have to find out how the European market works and which markets or segments are best suited for your offer. This means you have to invest time and effort in doing market research. Look at different countries and their characteristics; look at market segments, pricing, quality levels, volumes, and trends, for example, in order to find out where your offer will fit best. There is a lot of useful market information on the internet. You can also make use of CBI’s many in-depth and up-to-date studies on the European market for apparel. Learn more abouttrends and fashions on the European marketfor apparel. Learn more aboutEuropean demand for apparel. Learn more aboutEurope’s different apparel channels and segmentsand their characteristics. Learn more aboutdoing businesson the European market for apparel. Depending on the nature of your export product, you can choose from numerous websites to find the latest insights on fabrics, brands and innovation. * Leather Bizzis a leader in leather information. Most buyers visit different trade shows and events. They do this to connect with other players, including suppliers, but also to stay in touch with trends, such as the next season’s colours, trimmings, techniques and fabrics. As a supplier, you, too, will find trade fairs a great place to meet buyers and to get a better understanding of market developments. You can attend trade fairs either as a visitor or as an exhibitor. Advantages of going as a visitor first are that you can get a feel for the event, spend time talking with buyers and exhibitors, explore what others are offering and find out which halls attract most traffic (or the most worthwhile traffic) – and all that without the cost of exhibiting or the stress of running your own stand. If you decide to exhibit at a trade fair, make an effort to build a new collection around this important promotional event; invite new and existing buyers to your booth at the fair; and set clear marketing objectives for the event. For example, how many leads do you think you can generate? Are their existing contacts you can reconnect with at the fair and what (new) offer do you have for them? How many sample orders do you think you can acquire? The more clearly you think these objectives through, the better you will prepare yourself and your staff for the fair and the more likely you are to succeed. Exhibiting at a trade fair is exciting, enervating and tiring. What many less experienced exhibitors forget is that most of your trade fair business will develop after the fair, not during the event. This means that when a trade fair is over, you must take time to ensure effective follow-up. Be quick to send promotional materials, samples or answers that prospects have asked for. Make sure you do all you can to get the most out of every lead you generated at the fair. Another way of getting in touch with buyers and purchasers of fashion and apparel is to get involved with the trade associations and bodies they are affiliated with. The advantage of this approach is that it is ‘softer’ than cold-calling or hard-selling at a trade fair. As you do, remember it may be advisable to focus on the countries with the highest demand for apparel products. Try and liaise with the association management. Such liaisons often prove very useful in the long run, while in the shorter term these leaders often function as a first entrance to a nation. Most associations send out monthly newsletters with relevant industry updates. Signing up for these publications is a good way of keeping in touch with developments in the industry. A good listing with sector and industry associations in your home country can also be very useful in getting you in touch with European buyers. Some buyers may visit your country on a sourcing mission and one of their first steps will be to contact the sector and industry bodies in your country. A good way to locate other organisations active in the apparel sector is to search for them on the Internet using the following search words:sector association fashion Netherlands/UK,textile association,fashion federation,apparel federation,textile institute, or the GermanGesammtverband. Most brands and fashion retailers are registered with chambers of commerce and industry in their nations, or members of branch associations or institutes. In Europe, every country has its own fashion trade and textile association. Note that becoming a member of these organisations may give you access to more information, such as membership lists containing potential customers. Most buyers are active, or at least findable, onLinkedInorXing. These social media platforms for business have numerous groups related to apparel sourcing, apparel production, the latest fashion and other key words you can use to look for connections and communities.Facebookis not an appropriate tool for getting connected with buyers; in Europe most people use Facebook for private purposes. Compliance is more important than ever in the apparel industry. You have to be aware of (changing) standards and be prepared to comply, if you want to stay in business in Europe. This is especially the case sinceRana Plaza tragedyin 2013, in which the collapse of a garment factory killed over a thousand people and became the worst industrial accident in the history of Bangladesh. This incident changed the apparel production sector. The cry for full compliance and corporate social responsibility, in combination with reduction of carbon footprint and environmental impact, has since become louder than ever. Among other initiatives, it sparked theBangladesh Accord, an independent, legally binding agreement between brands and trade unions designed to improve the safety and health conditions in the country’s ready-made garment industry. If you run a fully compliant, state-of-the-art factory and are eager to join the chorus, it makes sense to check the Accord web regularly to keep stock of its signatories. As far as finding buyers is concerned, your performance in this field is a vital promotional tool. The better your performance, the more you need to communicate about it with prospective buyers – and the more interested many of them will be in your offer. Fair Indigo, a fair trade clothing initiative. Focussing on sustainability can open up doors to a whole new client base for you. Sustainability-related platforms and bodies often use so-called vendor charting and vendor rating. This is a technique for assessing and comparing the performance of different suppliers on the basis of specific indicators. IDHS, the Sustainable Trade Initiative, which focuses on promoting sustainable trade. Good communication is the basis for all successful cooperation, whether during or after a trade fair or at any other time. The more and better you communicate with a buyer, the better you will understand one another’s needs, wishes and restraints and the more you will be able to collaborate successfully. Be clear and honest about your company regarding its strengths and limitations. Don’t promise what you can’t deliver, be realistic (honesty is always the best policy). Try and build up more personal relationships, as this will put you in a more trusted and favourable position. If there is an issue or problem, for instance a delay in delivery or a technical problem, communicate this as soon as possible (don’t delay, as it only makes matters worse). Work together and develop an understanding of each other.